Clarification time. It says Crosshair, not CrossFire. So ATI fanboys can relax, this isn't an nForce chipset that supports CrossFire. It is, however, one of the most ridiculously impressive motherboards we've ever seen, and that's saying something. By the by, it also glows a sinister blue. 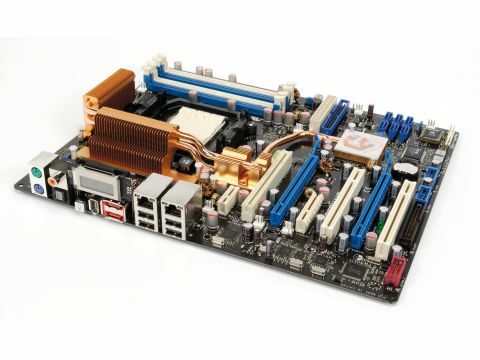 First, the facts: this is an nForce 590 SLI motherboard that supports AMD's latest AM2 processors, boasts more features than the Cannes film festival, and will delight overclockers with a BIOS overburdened with options and settings. It also lights up like a cool Christmas tree when you power it up, apparently so that you can get your bearings when crawling around inside your machine - it's an impressive effort, but do you really need your machine doing Close Encounters impressions at 2AM? So how does it perform? 3DMark 06, which is bundled with the motherboard, managed an overall score of 6,084 using a ATI Radeon X1900XTX, which is stunning. Setting up the motherboard to use the automatic overclocking made little discernable difference (well, the score went up by 105 3DMarks). Quake IV fared little better, going from 107fps up to a massive... wait for it... 108fps. To be honest though, this was only after experimenting with the default overclocking options, and there's a lot more scope for pushing your processor, memory and graphics card further. Core 2 Duo may be putting the fear of the silicon gods in AMD, but AM2 still has the upper hand when it comes to memory throughput, and with a score of 7,142MB/s from the 1,066MHz memory used for testing, it's a sizeable lead at that. Turn on the overclocking options, and the memory throughput nudges up even more to 7,269MB/s - far from shabby.